The study involved four major activities to estimate the current market size for fly ash. Exhaustive secondary research was done to collect information on market, peer market, and parent market. The next step was to validate these findings, assumptions, and sizing with industry experts across the value chain through primary research. Both top-down and bottom-up approaches were employed to estimate the complete market size. Thereafter, market breakdown and data triangulation were used to estimate the market size of segments and subsegments. As a part of the secondary research process, various secondary sources such as Hoovers, Bloomberg BusinessWeek, and Dun & Bradstreet were referred to identify and collect information for this study. The secondary sources include annual reports, press releases & investor presentations of companies, white papers, certified publications, and articles from recognized authors, authenticated directories, and databases. Secondary research was mainly conducted to obtain key information about the industry’s supply chain, market’s monetary chain, total pool of players, and market classification and segmentation according to industry trends to the bottom-most level, regional markets, and key developments from both market- and technology-oriented perspectives. As a part of the primary research process, various primary sources from both supply and demand sides were interviewed to obtain qualitative and quantitative information for this report. Primary sources from the supply side include industry experts such as CEOs, vice presidents, marketing directors, technology and innovation directors, and related key executives from various key companies and organizations operating in the fly ash market. Primary sources from the demand side include directors, marketing heads, and purchase managers from the end-use industries. Following is the breakdown of primary respondents. The industry’s supply chain and market size, in terms of volume and value, have been determined through primary and secondary research processes. After arriving at the overall size from the market size estimation process explained above, the total market was split into several segments and subsegments. To complete the overall market engineering process, and to arrive at the exact statistics for all segments and subsegments, data triangulation and market breakdown procedures were used, wherever applicable. The data were triangulated by studying various factors and trends from both the demand and supply sides. In addition to this, the market was validated using both top-down and bottom-up approaches. This research report categorizes the fly ash market based on type, application, and region, forecasting volumes and revenues as well as analyzing trends in each of these submarkets. 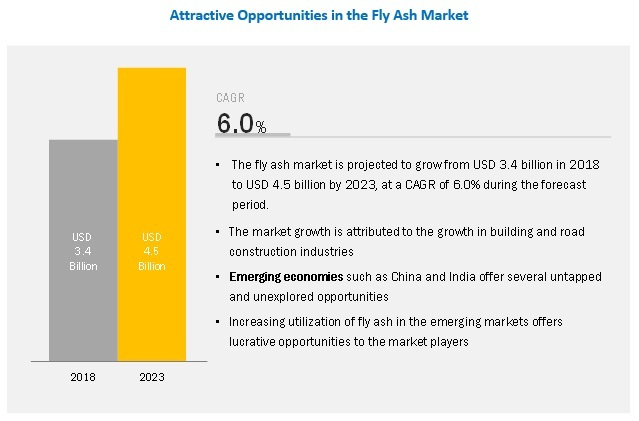 The fly ash market is estimated to grow from USD 3.4 billion in 2018 to USD 4.5 billion by 2023, at a CAGR of 6.0%. The fly ash market has been growing owing to the growth in the construction industry, increasing focus on infrastructure and road paving, problems related to dumping fly ash, promotion of fly ash by governments of various countries, and increasing focus on the use of environment-friendly products. Class F type segment expected to grow at the highest rate due to the increasing demand from the construction and infrastructure sectors. The main application of Class F type fly ash is in Portland cement, where it is used in mass concrete and high strength mixes. It is also suitable for concreting in summer as it moderates heat gain during concrete curing. The growth in the consumption of cement and cementitious materials from the construction sector across the globe has been driving the demand for Class F type fly ash. Increasing construction expenditure in China and India has also led to an increase in the consumption of Class F type fly ash. Portland cement & concrete application segment is the largest segment due to the increasing demand from residential and non-residential construction sectors. Concrete made from fly ash is slightly lower in strength than normal cement concrete of up to 30 days, around equal in strength in 30-40 days, and higher in strength than normal cement in around a year’s time. Fly ash concrete has lesser permeability and efflorescence than normal concrete. Construction expenditure in the Asia Pacific region has been increasing due to the rising demand for residential and non-residential buildings. The governments of countries such as China, India, Malaysia, and Indonesia are investing in infrastructure development, including the construction of new highways and freeways, thus driving the growth of the Portland cement & concrete segment. The fly ash market in Asia Pacific is expected to grow at the highest CAGR during the forecast period. The growing population in this region is placing a strain on the existing infrastructure and leading to the need for additional developments in the rail networks, residential buildings, and roadways. There is a significant need to invest in additional infrastructure to reduce the gap in the existing and the required infrastructure in the region. Thus, the road infrastructure projects by the governments of the Asia Pacific region countries are expected to drive the global fly ash market. Key players in the market include Boral Limited (Australia), CEMEX S.A.B. de C.V. (Mexico), Lafarge North America Inc. (US), Charah Inc. (US), Separation Technologies LLC (US), Aggregate Industries (UK), FlyAshDirect (US), Salt River Materials Group (US), and Ashtech (India) Pvt. Ltd. (India). These players have expanded their geographical presence through acquisitions, expansions, and agreements. Boral Limited, the market leader in the fly ash market, acquired one of its biggest competitors, Headwaters to further increase its market share. Such acts of consolidation can be followed by other players to improve their position in the unorganized fly ash market. In March 2018, Boral Limited acquired the Carbon Burn-out (CBO) technology developed by PMI Ash Technologies, LLC that helps in improving the quality of fly ash in coal-powered power plants. This helped the company in maintaining its leadership in the fly ash supply chain in North America. In May 2018, Charah Solutions acquired SCB International, Inc. (SCB) to develop and deploy innovative technologies for fly ash benefaction for sale to concrete producers, processing kiln dust to remove mercury, and to grind granulated blast furnace slag to be sold to concrete producers. This will help Charah Solutions in expanding its MultiSource fly ash network and meet customer demand. What are the upcoming industry applications for fly ash? What is the impact of the change in energy policy in the US on the fly ash market? What are the trends for utilization of fly ash in China and India? What are the trends for beneficiation of landfilled and ponded fly ash in the US and Canada? 11.4 Lafarge North America Inc.
11.10 Ashtech (India) Pvt. Ltd.